Democrat Matt Dababneh currently represents Assembly District 45 and will not be termed out until 2024. Dababneh is expected to easily win re-election in 2016. Matt Dababneh, former Chief of Staff to Congressman Brad Sherman, was elected to the California State Assembly in November 2013. 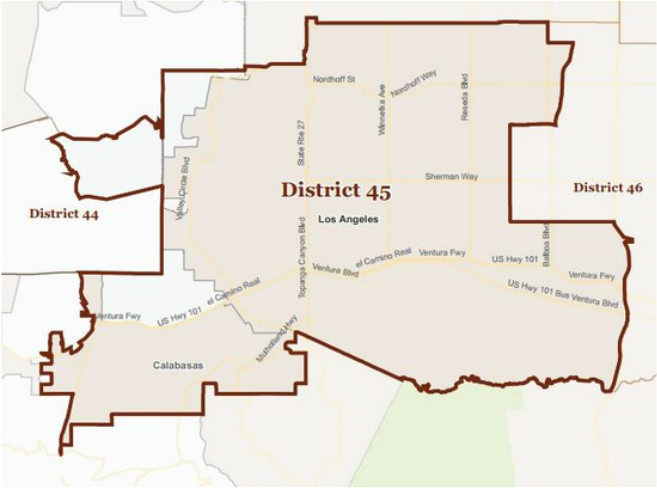 He represents the 45th Assembly District communities of Bell Canyon, Chatsworth, West Hills, Hidden Hills, Calabasas, Canoga Park, Woodland Hills, Winnetka, Encino, Reseda, and Northridge. A fourth-generation Valley resident, Dababneh was born and raised in the San Fernando Valley. He graduated from the University of California, Los Angeles with a degree in Political Science and History. Upon graduating from UCLA, Dababneh worked on John Kerry's presidential campaign, where he was inspired to pursue a career in public service. For the past eight years, he has served as the District Chief of Staff and Senior Aide to Congressman Brad Sherman, where he has assisted thousands of Valley residents and businesses with federal and local concerns. He has worked with seniors needing help with their Medicare and Social Security benefits, homeowners struggling to avoid foreclosure on a family home, and businesses trying to resolve disputes with the IRS. Through this work, he has developed deep relationships with West Valley residents and an understanding of the issues concerning local residents. Dababneh is an active community volunteer and has served on the board of several local non-profit organizations, including the Hope of the Valley Rescue Mission, the Valley Cultural Center, Phoenix House Juvenile Drug Rehabilitation Academy and the House of Hope. Dababneh's philanthropy inspires him to help the struggling regain financial independence and improve their quality of life. As the new State Assemblymember representing the 45th District, Dababneh will work to improve the business climate, restore the state's education system and improve health care and constituent services.